Consider two d.c. series generators in parallel as shown in the Fig. 1. 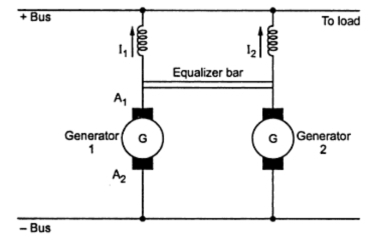 If no load voltages E1 and E2 of the two generators are initially same, generators supply equal currents and have equal resistance for its field winding. If E1 > E2 then I1 > I2 which causes the field of generator 1 strengthened while that of 2 is weakened which will decrease E2 further. A stage is reached where generator 1 will take entire load and will also supply power to generator 2 which will start running as a motor. The two machines will form a short circuited loop which will increase the current indefinitely. This can be avoided by use of equalizer bar through which equal currents are passed in the two similar generators to the load. The slight difference in the currents therefore being confined to the loop made by the armatures and the equalizer bar.